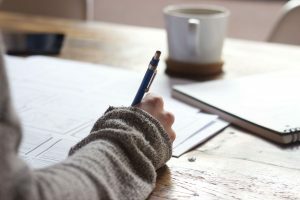 As I sat at my kitchen table writing down the things I wanted to pray for during my prayer time, I made an unsettling discovery: my prayer list looked uncomfortably similar to my grocery list (which was not far away on the table as well). Don’t get me wrong, it’s OK to ask for what we need. Jesus instructed us to ask for “daily bread” (Matthew 6:11). Jesus was not only referring to literal bread, food; he was referring to all our daily needs. Yes! Pray for what we need – for today. Each day. Paul tells us not to be anxious about anything, but in every situation…present our requests to God (Philippians 4:6). Go ahead and ask. 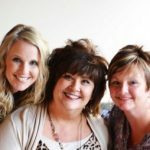 But as I sat there at the kitchen table, I began to realize that prayer could be so much more than simply asking for personal comfort and well-being for myself and for those I loved. I realized that prayer could be something more than a grocery list. I’ll say it again: Don’t get me wrong! I’m not saying we shouldn’t “present our requests” to God (Philippians 4:6), but I find it telling that we spend so much of our time praying for earthly comfort. What if we prayed for something more? 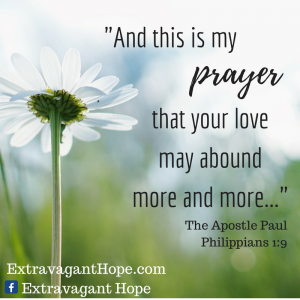 What if we prayed more like Paul? 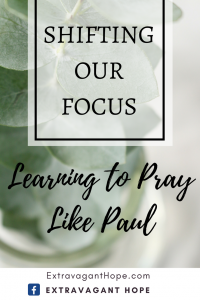 In my search to find what that “something more” could be – in my prayer life as well as in the life of the church – I was inspired by how Paul prayed. Yes, Paul prayed for immediate needs; but Paul most often prayed for for spiritual things, eternal things, rather than temporal things (temporary physical things). I was also struck by the fact that Paul most often (but not exclusively) prayed for others rather than himself. Just take a look at three of the prayers Paul prayed. The things he prayed for absolutely blow me away! I want to pray like this! Paul prayed that God would give the Ephesians (others) wisdom, revelation, and enlightenment so that they would know Him and know hope. Wow! Imagine what my prayer time would be like if I prayed such things for myself and the people on my list. Imagine how it might change our lives! Just imagine. Paul prayed that they (the Ephesian church) would be empowered with inner strength – that their roots would grow deep; that they would come to understand the depth of God’s love and be made complete. Powerful. Isn’t this what we want for the people we love? Isn’t that what we want for ourselves? I wonder what would happen if I prayed this for myself and my children…my grandchildren…for everyone I know? How might the world be changed if everyone experienced the love of Christ and were made complete in the fullness of God? I wonder. What if more people loved greatly? What if we had not only knowledge, but insight and understanding? What if we were able to discern what is best in God’s eyes? Life changing. World changing. What if we were filled with the fruit (the results, the evidence) of God’s righteousness. Why was I not praying these things for myself and the people in my life? 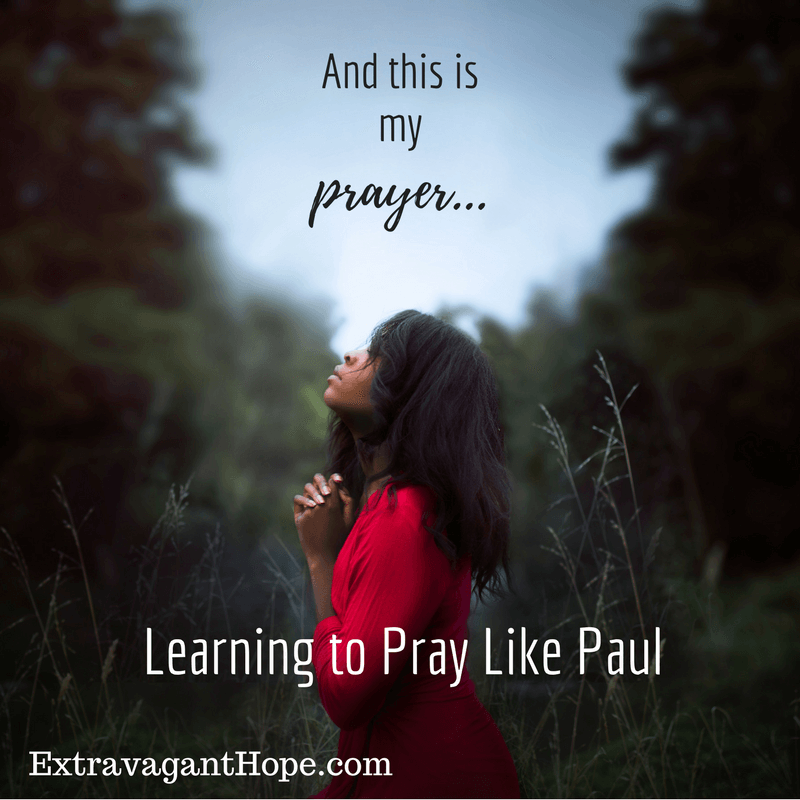 What would happen if I began to pray more like Paul? What if? The Salvation of Others – even for his adversaries! (See Acts 26:28-29 & Romans 1:10.) Who do you know that doesn’t know the salvation of Christ? Both people you love and your adversaries? Add them to your list. Pray for their salvation. The Expansion of the Gospel – (See 2 Thessalonians 3:1) Let’s add getting the message out to our list, too! -For the faith and perseverance of fellow believers. This is just the tip of the iceberg. Can you see that even in the things for which Paul gave thanks, he focused on the spiritual, the eternal, and not the comforts of the here-and-now? What spiritual, eternal things can you start giving thanks for? Add them to your list. Most of us can probably identify with this comfort in sameness even though we’re not on the spectrum. We like routine. We feel comfortable with habit. Routine and habit can be really good things. But they can also get us stuck in a rut if we’re not paying attention. We can develop habits that are hard to break; habits that limit our potential growth. 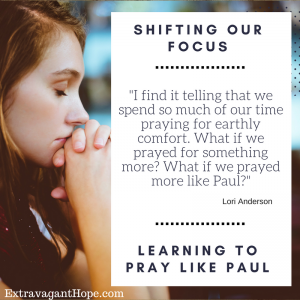 I’m going to ask you to set aside your comfort; set aside the sameness, and embrace change as we consider how Paul prayed and learn to pray like him. Let me say it one last time: There’s nothing wrong with asking for what we need. But what if we also prayed for something more? What if we prayed for others and not just ourselves? What if we prayed for spiritual growth and maturity and love and discernment and salvation and the advancement of the gospel? What if? 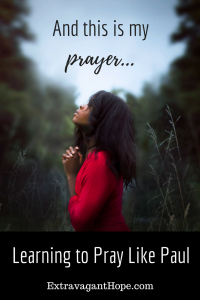 We’ve created a free prayer journal, just for you! Sign up below and we’ll send it straight to your inbox. Yes, I want my FREE Prayer Journal! If you haven’t used e-products before, I’ve (Cheryl…switching writers here) recently discovered and fallen in love with the Evernote App. It allows me to highlight and write directly on my pdf files using my Kindle. 1. Open your app store and download the free app Evernote onto your Tablet/Kindle/iPad. 2. 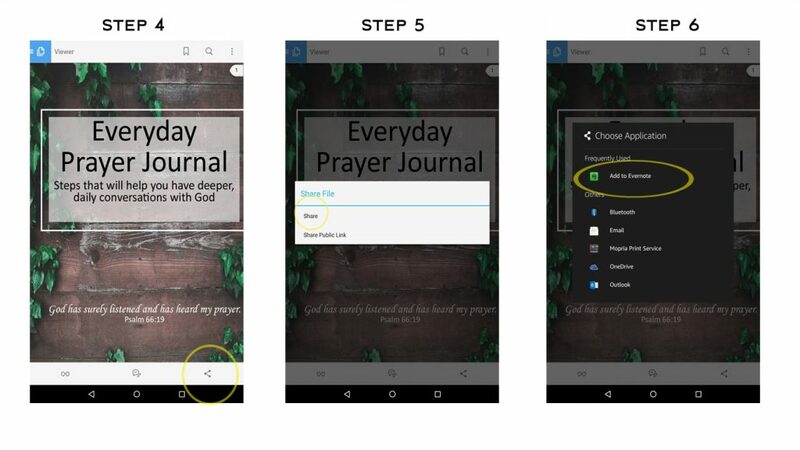 Now, from the email we sent you, download the pdf (Everyday Prayer Journal) onto your Tablet/Kindle/iPad. 3. Usually, the download automatically opens, but if it doesn’t, open it. 4. Click on the share icon. 5. Click on the share button. 7. Once the journal downloads into Evernote, you can click on the icons at the top of the page in Evernote to highlight, write and erase. This video to shows you how to download this pdf into Evernote on your computer. If you don’t think you are techy enough – I promise, it’s not that hard. Plus, once you start putting e-products on your tablet, you realize you can carry way more books with you anywhere, write directly on them (and erase) – it’s so handy, it’s addictive. Looking for more resources to inspire you and help you Pray Like Paul? Extravagant Hope is talking about prayer all month. The invitation to pray, without ceasing, asking, for our daily bread (I’d not thought of it that way) all the way to being filled to the measure of God’s fullness . He is interested in the whole of us! Amazing! Thank you fo sharing this! Chris, it is a constant reminder for me as well – to remember to pray (as you put it) for the measure of God’s fullness and not just my own comfort. Yes! He is interested in the whole of us (and not just our physical needs). I always thought I was not a good prayer because I had a hard time with long prayers. What a relief to find out that God loved my short popcorn prayers that I prayed through out the day. They come from my heart. When I see an ambulance or police car coming down the road with flashing lights and siren son I immediately go to prayer. If a name or situation comes floating through my mind I immediately go to prayers. Yes I confess that I am a popcorn prayer but God loves me and I love him. Melinda, I think those “popcorn” prayers throughout the day are part of what Paul meant when he said, “pray continually” (1 Thessalonians 5:17). We don’t need to worry about length or “good” and “bad” prayers. We don’t have to be eloquent. God hears us.